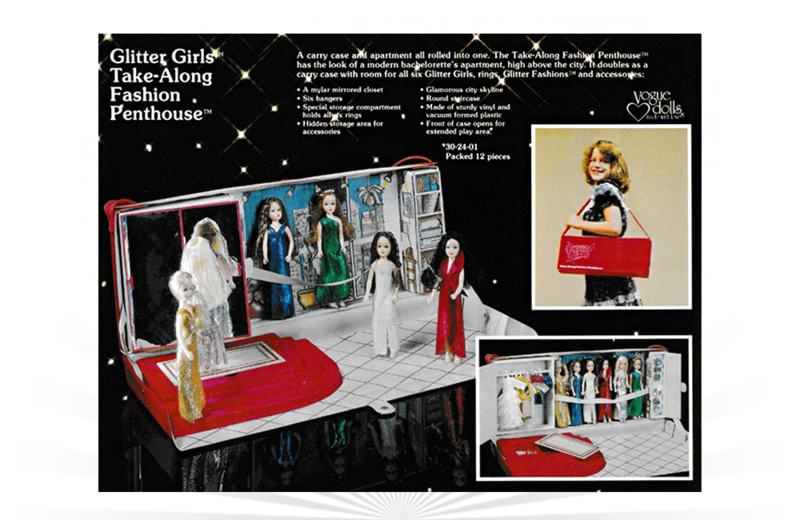 A dealer ad from 1982 for the Take-Along Fashion Penthouse for the Glitter Girls line of dolls from Vogue-Lesney. The Glitter Girls were a set of six 5-1/2-inch tall dolls that promoted a lifestyle of glitz and glamour. Each doll came adorned in gemstone-hued gowns that tied in directly to their name: Amber, Crystal, Jade, Pearl, Ruby, and Sapphire. Fashion sets for the line continued the theme, with each containing the word “glitter” in the name. The Take-Along Fashion Penthouse was a carry case, and apartment all rolled into one. This “modern, bachelorette’s apartment” included space for all six Glitter Girls, rings, Glitter Fashions, and various accessories. Made of vinyl and vacuum-formed plastic, the Penthouse came equipped with a mylar, mirrored closet, hidden storage areas, and a red, round staircase. "Who's the kid with all the friends hangin' 'round?" In 1963, Gilbert released The Wing Thing, an “all-weather flying vehicle” that stood a whopping 36-inches long by 48-inches wide.